A stunning gallery of Goya's later works, this lavish volume presents prints from The Proverbs, La Tauromaquia, and The Bulls of Bordeaux. 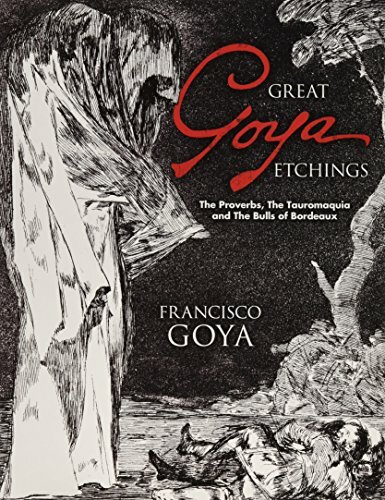 Its 78 etchings recapture the incomparable grandeur of Goya's art as well as the major themes of his works — the Bible, human folly, and the brutal pageantry of bullfighting. Savage yet sympathetic, the nightmare visions of The Proverbs are among Goya's most enigmatic works. The realism of La Tauromaquia and The Bulls of Bordeaux is similarly striking, with remarkably accurate images of bulls and fighters. Each etching appears with the original caption and an English translation. Additional text sheds light on the life and times of the great Spanish master. Students, collectors, and other art lovers will prize this magnificently reproduced edition, which is also the lowest-priced collection of Goya's etchings. The last of the Old Masters and the first of the Moderns, Francisco Goya (1746-1828) was a court painter whose portraits of the Spanish royal family exhibit a remarkable frankness and lack of flattery. Goya’s later works took on a darker cast and are considered the precursors to the Expressionist movement.